Pet owners tend to treat their animals well. This includes feeding them high quality foods and ensuring they receive the best medical care possible. There are tradeoffs and good care does not mean unlimited spending. But, good care does result in relatively high expenditures on pets. About 68% of U.S. households have a pet, according to the American Pet Products Association. That includes nearly 90 million dogs and more than 94 million cats along with millions of fish, birds and other animals. 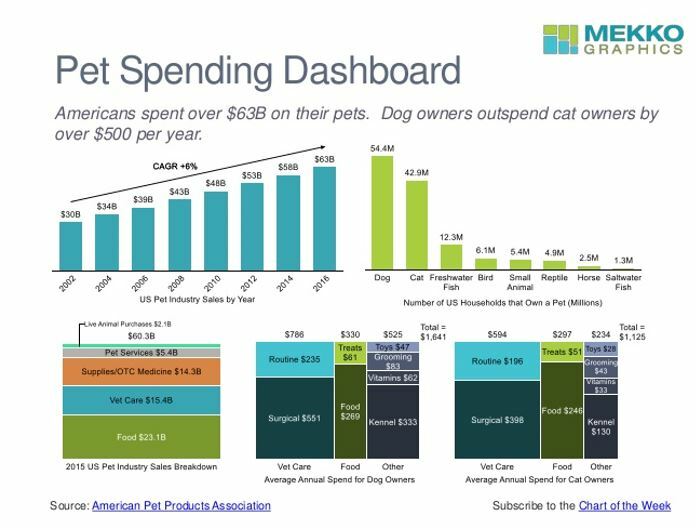 Americans spent an estimated $69.5 billion on their pets in 2017 and that figure is expected to grow 3.8% to more than $72 billion this year according to the American Pet Products Association. This figure has grown every year since 2000, including during the recession years of 2008 and 2009. While pet spending may not prove to be recession proof in the future, it is likely to remain high under any economic conditions. Vet care is the second largest expense, accounting for $17.1 billion last year, trailing only food. Expenses associated with veterinary care are expected to grow 7% this year. There are approximately 66,000 veterinarians and 31,000 animal health clinics in the U.S., according to the Census Bureau. The Association found that dog owners spent an annual average $731 on routine and surgical vet visits combined while cat owners spent an average of $427. These trends point to several possible investment themes. One is simply to buy shares of companies that deliver products and services to pet owners. This would include Petmed Express (Nasdaq: PETS), a stock that broke out in 2016 and is now bouncing off of long term support. “Simply put, the company’s execution continues to be second to none,” Raymond James analyst John Ransom said in a recent note to clients. Idexx is the industry leader in supplying vets with the technology to run in clinic tests and blood work. It focuses on dogs and cats. Canaccord Genuity analyst Mark Massaro believes the company’s market share in the U.S. is about 60%. In clinic products give vets the ability to run chemistry panels. Other products include rapid test kits, veterinary instruments and analyzers. There are also external laboratory services such as diagnostic imaging and testing. According to company data, some kind of diagnostic test is administered about 40% of the time when animals are brought to the clinic. Idexx’s animal diagnostics unit generated more than $1.7 billion in net revenue in 2017, about86.5% of its overall $1.97 billion in revenue for the year. The company has seen success with SediVue, the industry’s first in-clinic urine sediment analyzer. And its recently launched product, Catalyst SDMA, an in-clinic test used by vets to look for kidney disease, was adopted by 42% of its North American customers in the first few months of its debut. He points to the company’s unusually large direct sales force — 435 sales reps in North America and more than 100 in Europe — as a particular strength. This could explain the stock’s market leading performance. Gains in Idexx are likely to continue as management raised its full-year earnings guidance by 2 cents. They now expect earnings per share to be between $4.06 and $4.20. Management also It reaffirmed its sales outlook, adjusted for exchange rates, at 12% to 14% growth. Even though Raymond James’ Ransom had high praise for the company, he only reaffirmed his market perform rating in the same note to clients, citing the high price-to-earnings multiple as a hindrance to a more positive rating. More broadly, Raymond James’ Ransom said in April that investors shouldn’t expect growth to ramp up in the end-market for companion animal diagnostics. But given the baseline growth rate of the animal health diagnostics industry, Canaccord Genuity’s Massaro says that means that “even the worst company in the space would grow 6% to 8%” each year. “It really is a spectacular industry,” he said. Investors could also consider competitors which include Heska (Nasdaq: HSKA) where analysts expect earnings growth to average 25% a year and Zoetis (NYSE: ZTS) which is expected to grow earnings at about 16% a year. Zoetis is acquiring Abaxis, another large company in the field which could drive additional growth. Americans are unlikely to neglect their pets and that means growth should continue in the veterinary sector. This sector, however, might not be represented in the portfolio of many investors and these stocks could help deliver gains in what appears to be a growth industry.